Battle Pass in Fortnite BR. The Battle Pass is a system of progression in Fortnite Battle Royale that lets you earn in-game rewards as you progress and level up. You have to purchase the Battle Pass to unlock it. The price for the Battle Passes of Seasons 2, 3, 4, 5 ,6 and 7 have been 950 Vbucks. It is possible that in future seasons the price will be increased, or that you will only be able to buy it using real-life currency and not Vbucks. If you don't buy the Battle Pass, you advance only in tiers of the Free Pass. The Free Pass offers some rewards, but not as many as with the Battle Pass. Purchasing the Battle Pass also lets you progress faster because of additional challenges as well as experience boosts. Although the Battle Pass offers more, you can still obtain cool items from the free pass if you work hard enough. "Tier" is basically the "Level" of your Battle Pass. You start at Tier 1 and will advance up to the max tier by collecting Battle Stars. Every new tier you unlock additional rewards. You need to collect 10 Battle Stars to advance one Tier. 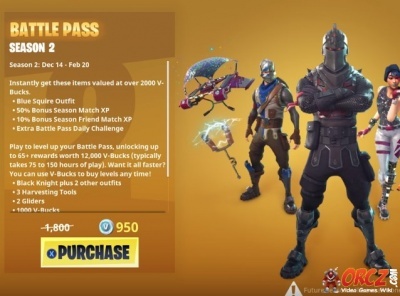 You can also purchase Battle Pass Tiers to instantly advance one or more Tiers. In Season 2, max tier was 70. In Season 3, max tier was increased to 100. In Season 4, it was also 100. In Season 5, 100 tiers. In Season 6, 100 tiers. In Season 7, 100 tiers. To progress in the Battle Pass, you need to earn Battle Stars. Doing challenges is the fastest way to get the Battlestars, completing a daily challenge gives you five battle stars, while weekly challenges can grant up to 10 Battle Stars. Each season has its own theme for the Battlepass. The theme for season 2 was a medieval theme and included knight outfits, shields, etc. The theme for season 3 was a space theme and included astronaut outfits, oxygen tanks, etc. The theme for season 4 was a superhero theme that included movie characters, hop rocks, etc. The theme for season 5 is a historical theme that included vikings, rifts, etc. The theme for season 6 is a Halloween theme that included pets, shadow cubes, etc. The theme for season 7 is a Christmas theme that included wraps, planes, etc. Once unlocked, these rewards can be equipped through the Locker.